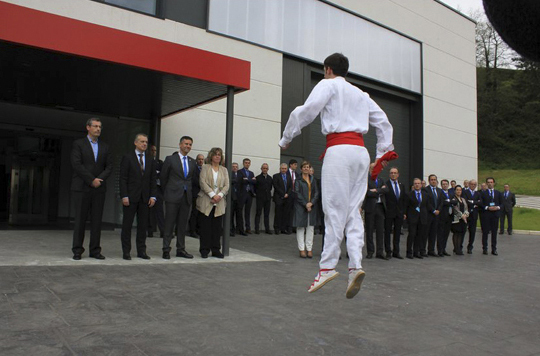 On the occasion of the 25th anniversary of the Machine-Tool Institute-IMH, last 19th April, the Lehendakari, Iñigo Urkullu, attended the inauguration of the building that houses the Asmaola project, which provides support to small and medium enterprises in their manufacturing processes. He underlined that the project forms part of the “triangle of competitiveness” that the Basque Country needs to be able to “train people in order to respond to the future challenges of industry”. The regional minister of Economic Development, Arantxa Tapia, the regional minister of Employment and Social Policies, Angel Toña, as well as the regional minister of Education, Linguistic Policy and Culture, Cristina Uriarte, the general MP for Guipuzcoa, Markel Olano, and the mayor of Elgoibar, Ane Beitia, also attended the official presentation of the new facilities in Elgoibar. This new building will house a project that started its activity almost six years ago as a support innovation centre for SMEs, which has grown throughout this period and now includes 13 VT centres within a networking system. The mayor of Elgoibar, Ane Beitia, took advantage of her intervention during the celebration of the 25th anniversary of IMH to “encourage all SMEs to make use of the research and innovation services provided by Asmaola”. On his part, the general MP for Guipuzcoa, Markel Olano, ensured that "with the start up of Asmaola, a dream of the whole of Guipuzcoa comes true”, as “it provides a solution for those SMEs that have problems connecting to know-how and starting up innovative processes”. Xabier Ortueta, President of IMH and Director General of AFM highlighted that “nowadays, companies with limited resources can also launch the small research projects that they need”. Ortueta highlighted yesterday the evolution experienced by the institute throughout its now extensive trajectory, “until it has become a comprehensive education centre with a formative pathway that enables young people to complete their training in a down-up manner”. He also emphasised that IMH, which manages an yearly budget of approximately Euros 4.5 million, “offers workers and unemployed the possibility of recycling, it makes the transition from VT to University possible, and sometimes it even plays the role of training methodology laboratory”. In any case, Xabier Ortueta believes that the “differential value” of IMH lies “in its ability to place ideas on the table that nobody else does”. In his words, “this is a centre full of singular initiatives and those ideas are precisely those that have led to the evolution of IMH and to its transformation into something much more than a VT centre”. And for Ortueta, “the Machine-Tool Institute has gone from being a car to an aeroplane which must now be made to fly” and that is “one of the two challenges we have to face”. In his intervention, the Lehendakari recalled that Asmaola has become the best “travelling companion” of companies that are starting to innovate and need R&D support. “It drives the transfer of knowledge, the leap from research and innovation to the development of new products and services”, he underscored, adding that the project forms part of the “competitiveness triangle that the Basque Country needs, and that it combines training, innovation and enterprise”. “It is what we call collaborative innovation”, he added. Urkullu emphasised that Asmaola is “keeping ahead of the change in productive model” and defended the need to “foster an industry based on the Advanced Manufacturing model”. “It is the technologically advanced industry, the so-called ‘Factory of the Future’”, he pointed out. Along that line, he indicated that the Basque Government is currently working on that same line of support to training, innovation and enterprise. In fact, a recent study prepared among 700 Basque companies concludes that two out of every three foresee hiring personnel this year and practically half of them, 46%, will resort to students from specialised Vocational Training cycles. “The Basque Country needs trained and specialised people, who are able to respond to the future challenges of industry. Achieving this will enable us to gain in competitiveness, offer job opportunities and advance in social cohesion”, Urkullu expressed. Finally, the Lehendakari encouraged everyone to continue to work “together” along this line and recalled that the Industrial Climate Index in the Basque Country had, for the first time since 2008, a positive value in the first quarter of the his year. Likewise, the Industrial Production Index rose by 3.5% last year and has grown more than 5% in January and February this year.